Janet writes that architects like Norman Foster (tax exile architect) have notoriously huge egos and want to leave a legacy of important monuments so they can be revered after their death. He’s already given us the Gherkin and Wembley Stadium, but this monstrous white elephant of an airport in the Thames Estuary must be consigned to the recycling bin. And that Lord Foster says the problem with Brits is that we endlessly argue about what to do. Stansted (which he designed) took 24 years to build, whereas the airport for Beijing in China took just four. The reason for that, Lord Foster, is that we live in a democracy — it’s not dithering, it’s called letting voters have their say. And Janet says that Lord Foster cares so much about the UK that he has based himself in Switzerland for many years. Lord Foster, the tax-exile architect who enriched the City of London’s skyline with an office building that’s less a soaring virility symbol and more a mini cocktail gherkin, has been bleating that Britain MUST have a new airport built in the Thames, in order to assume our rightful position as a major world player. What a co-incidence that last November the same Lord Foster came up with proposals for a £50 billion new airport, to be built on reclaimed land off the Isle of Grain. Under the runways would be the UK’s busiest railway station, handling 300,000 passengers a day. Boris Johnson — always a fan of big brash statements — has backed the plan. Leaving aside the fact that environmentalists loathe the idea, locals are incandescent and naturalists are worried about the impact on birdlife, why should we build a huge airport to the east of London? Grain is where a fifth of all our gas comes ashore and is stored — a major safety consideration. The people who live in this bleak and unlovely area are not posh Old Etonians with farmland and swanky homes, but members of the working class who commute to London. Why should their modest properties and their quality of life be eroded because businessmen and international travellers need to save 20 minutes on their journeys? And who is to say that air travel will expand in the next 20 years? 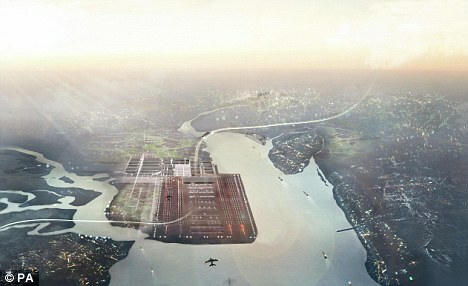 Final call for Heathrow airport, but will ‘Boris Island’ ever get off the ground? Lord Foster says we need to capture the spirit of the Victorian age, the era that gave London beautiful railway stations and an elaborate sewerage system. Yes, during the Victorian era life expectancy rose gradually to 48, a quarter of the population lived in abject poverty, education was not compulsory and 40 % of the wealth was owned by 5% of the population. Dirt and disease were rife — 60,000 people a year died from TB throughout Victoria’s reign. For every grand monument in Victorian England, you can come up with another story of misery and deprivation. Lord Foster says the problem with Brits is that we endlessly argue about what to do. Stansted (which he designed) took 24 years to build, whereas the airport for Beijing in China took just four. The reason for that, Lord Foster, is that we live in a democracy — it’s not dithering, it’s called letting voters have their say. In China, a third of the children have high lead levels in their blood as a result of air pollution. China remains the world’s biggest environmental disaster, in spite of promising to clean up. Only 1%t of city dwellers there breathe air considered clean by EU standards. All those wonderful monuments that top architects like Foster designed for the Beijing Olympics distract us from the reality that most working people live in poor conditions. As for human rights and freedom of speech, China’s lacklustre track record is well documented, the internet is monitored and websites closed at will. Lord Foster cares so much about the UK that he has based himself in Switzerland for many years. Awarded a life peerage in 1999, he made his last speech in the Upper House in 2003. When new legislation was introduced in 2010 banning peers and MPs who did not pay their tax in the UK from voting, he resigned — although he cannily decided to hold on to his title. If Lord Gherkin really wanted to reshape Britain, to make it a better place to live, to modernise our antiquated planning laws and help improve our city centres, he would have stayed in the UK and paid his tax here. Foster’s office is large and highly successful — he’s designed hundreds of international projects, from luxury apartments in St Moritz and an airport in Hong Kong, to a lavish Palace of Peace in Kazakhstan, another country with a questionable human rights record. Kazakhstan, a former Soviet satellite state, has been independent only since 1991, and is said to still use child labour in its cotton and tobacco industries. Anyone who criticises the government faces jail or harassment. 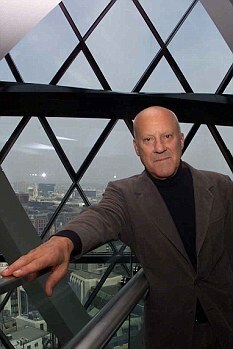 Architects like Norman Foster have notoriously huge egos and want to leave a legacy of important monuments so they can be revered after their death. He’s already given us the Gherkin and Wembley Stadium, but this monstrous white elephant of an airport in the Thames Estuary must be consigned to the recycling bin. f this airport is built it will never be used. We are doing everything possible to cause runaway climate change and rising sea levels. This idea demonstrates the hubris of our leaders who think they can ignore climate change and commit the public to billions for an Airport that will soon be underwater. It is easy for people like Norman Foster to propose this. His luxury mansion in the Alps will be not be flooded unlike, unlike the homes for millions of others who can not afford to move. Foster was knighted in 1990 and appointed to the Order of Merit in 1997. In 1999, he was created a life peer, as Baron Foster of Thames Bank, of Reddish in the County of Greater Manchester. As a resident of Switzerland, in 2010 he stepped down from his seat in the House of Lords in order to maintain his non-domiciled status, and so be able to avoid paying UK residents’ taxes on income earned abroad. ^ “Tory donor Lord Ashcroft gives up non-dom tax status”. BBC News. 7 July 2010. Posted: Monday, January 23rd, 2012. Filed in News about Airports, Recent News.